The Aamir Khan starrer sports biopic Dangal follows the life of an amateur wrestler Mahavir Singh Phogat from the northern Indian state of Haryana who gave up wrestling owing to financial difficulties, but went on to training his daughters Geeta Phogat and Babita Kumari to become world-class wrestlers. Khan plays Mahavir and the film is directed by Nitesh Tiwari. For everyone who has not watched much Bollywood movies might have some kind of cliché notions on Indian films with the usual song and dance routines. However, the new age filmmakers have started realizing the power of cinema and hence exploring new subjects that not only cater domestic audiences but also international market. Dangal is one of those few films that has all ingredients with a universal appeal even though some elements are more rooted to Indian culture and tradition. For every other filmmaker it’s always difficult to pick up such a tricky subject line. Even though many of us in India are well aware of the success of Geeta who won gold medal (55kg) in 2010 Commonwealth Games, where Babita won the silver (in 51kg), we have little knowledge of their struggle. This indeed makes it the story that only an actor/producer like Aamir Khan can count on. Dangal (English: Wrestling competition) captures the struggle of Phogat family particularly the father who had to battle it out the status quo of a typical north Indian society where girls are not supposed to wrestle. The film brings on screen Mahavir Phogat’s stubbornness, his earnestness and his dream of making his daughters medal-winning wrestlers. The characters are real, grounded and focused, and so are the actors here, who have done justice to their roles with artistry and compelling acts. Aamir Khan very rightly referred to as the perfectionist who don’t hesitate to go the extra miles in terms of research and physical transformations to play his part. The 51-year-old actor has yet again proved his mettle in having faith on the power of stories, moving away from Bollywood’s tried and tested formulae of masala films. 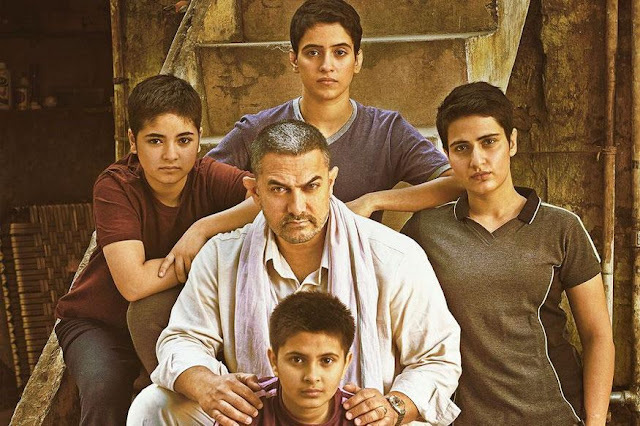 While we can say that Dangal is all about the story and Aamir’s performance, we should also clap for the screenplay as well as the acting of his co-stars, including Zaira Wasim and Suhani Bhatnagar as young Geeta and Babita, and Fatima Sana Shaikh and Sanya Malhotra as the adult Geeta and Babita along with TV actress Sakshi Tanwar as Mahavir’s wife. Having said all about the performance and the story, the film made its point with its feminist statement pushing both boys and girls to the equal sphere. One can even see a political statement (if you’re inclined to) considering the Khap-ridden state of Haryana where the boy-girl ratio is still a matter of concern and even so the cases of female infanticide and honour killings. In the film Dangal, Phogat showed his girls the way to wrestle under adverse circumstances, and at the same time it instils hope among others to come out of such darkness. Dangal was released in the United States on 21 December 2016, two days earlier than its worldwide release.